CVO meeting minutes of April 18, 2018 at Jesse Brown VA. The next meeting of CVO will be this Wednesday, October 18th at 7 PM in the Prescription Conference Room on the 2nd Floor of the Jesse Brown VA Medical Center at 820 S Damen Ave in Chicago. Parking will be validated. The agenda will include a presentation, a welcome for new members and a discussion of all the events and special deals for Veterans Day, November 11th. As usual, there will be refreshments. 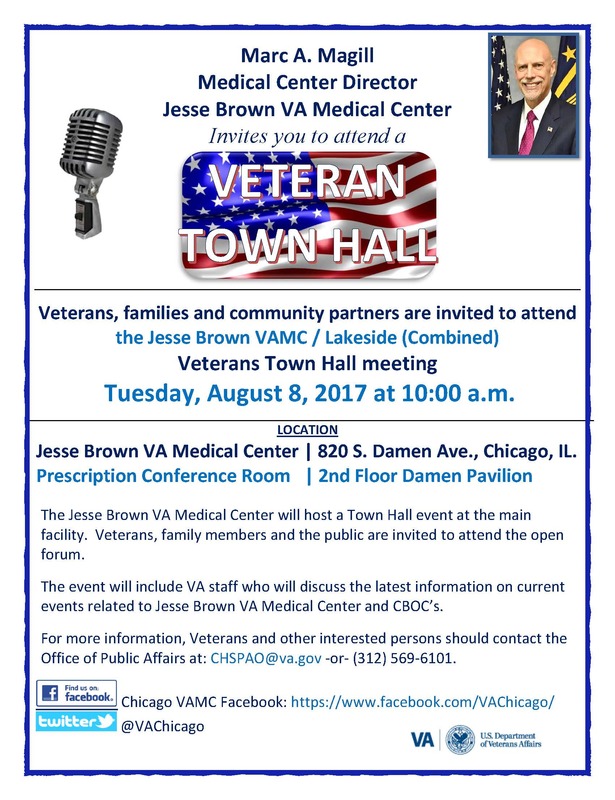 The next meeting of CVO will be this Wednesday, August 16th at 7 PM in the Prescription Conference Room on the 2nd Floor of the Jesse Brown VA Medical Center at 820 S Damen Ave in Chicago. Parking will be validated. The Veterans Against Violence Committee will meet at 6 PM before the meeting. If you want to participate with this committee, be sure to show up at 6 PM in the Prescription Room. We will also continue the discussion of feedback from all Member Organizations on what they need and expect from CVO and the direction of CVO in the future. Further, we will continue our discussion of Veterans Dental Care. We will have a sheet where attendees will put in their names as well as those of their State Senators and Representatives. The purpose will be to have a list of who is represented by whom, but it will also show who does and does not know who their legislators are. REMINDER: If you have not already done so, please contact your State Senator and Representative, asking them to sign on as cosponsors for Senate Bill 922 and House Bill 1803, to provide dental care for veterans. In addition, please spread the word to the members of your organizations, and please tell the members of your organizations to do the same. If these bills die in committee, for a lack of support, we will have only ourselves to blame. As usual, there will be light refreshments. The next meeting of CVO will be this Wednesday, July 19th at 7 PM in the Prescription Conference Room on the 2nd Floor of the Jesse Brown VA Medical Center at 820 S Damen Ave in Chicago. Parking will be validated. The agenda will include feedback from all Member Organizations in attendance on what they need and expect from CVO and the direction of CVO in the future. Further, we will continue our discussion of Veterans Dental Care. There will be a presentation about a program where veterans who dropped out of high school to enlist, can now get their diplomas. CVO meeting minutes of March 15, 2017 at Jesse Brown VA. The next meeting of CVO will be held on the third Wednesday of the month, November 16th, at 7 PM in the 2nd floor Conference Room of the Jesse Brown VA Hospital. There will be a limited number of Chicago Wolves tickets available, for their Nov. 19 “Salute to Military Families Night,” and coupons good for a free haircut. First come, first served. As usual, coffee and donuts will be available. Come out and support CVO! 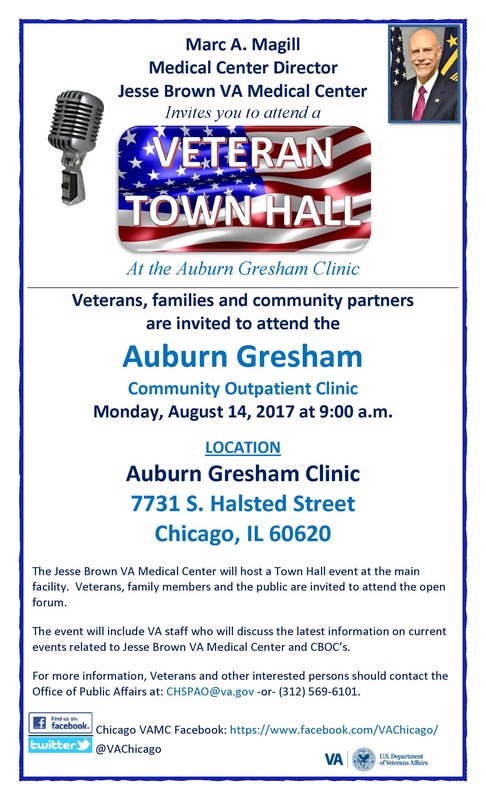 The Jesse Brown VA Medical Center will conduct a Town Hall Event to allow and enhance feedback from Veterans, their families and other beneficiaries. The facility operates four Community Based Outpatient Clinics (CBOCs) located in the Lakeside (downtown) area and Auburn Gresham (south side) community of Chicago, a clinic in Chicago Heights, IL, and the Adam Benjamin, Jr. VA Outpatient Clinic in Crown Point, IN, which serves four counties in Northwestern Indiana. VBA, Regional Office, officials will attend. When: Wednesday, November 9, 2016, 11:00 a.m. – 12:30 p.m. The Jesse Brown VA Medical Center will be hosting a memorial service on Sunday, November 20, 2016 from 2:00 p.m. – 4:00 p.m. We will be honoring the life and memory of all recently departed Veterans and employees. All are welcome to attend. When: Sunday, November 20, 2016, 2:00 p.m.
For more information, contact us at: (312) 569-8602 or (312) 569-6328. News media should contact the Office of Public Affairs at (312) 569-6402.